The winner of 2012 AKC Nationals is coming back, and will be presenting four mini seminars. 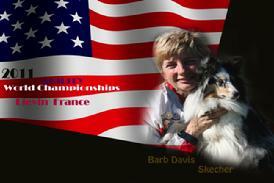 Barb is a seven-time AKC Agility World Team Member and has won seven National Championships. She was a mathematics instructor for 21 years at the high school and community college level. These combinations of skills provide for excellent instruction for students of Dog Agility. Any Questions about the seminar? Your registration is not complete until we have received payment!